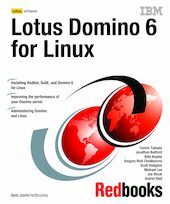 This IBM Redbooks publication describes how to run the IBM Lotus Domino 6 server on the Linux platform. While Lotus Domino 6 is platform-independent, some specific knowledge about the platform and configuration is required to ensure that the Domino 6 server is running most efficiently. The book provides detailed instructions for installing Linux and Domino 6 for Linux, and describes how to achieve maximum performance of your system. System administration and security techniques are explained and tools for managing and troubleshooting are discussed as well. Detailed scenarios illustrate some of the features of Domino 6 on Linux, in particular user registration, directory synchronization, creating a Domino application, and accessing external data using DB2 and MySQL. We describe how to configure Domino as a Web server, including the new security options specific to the HTTP protocol in Domino 6. Strategies and techniques for virus protection and data backups are presented, along with details about some of the third-party software packages available to help you with these management tasks. This book is written for administrators with strong Domino and Windows operating system skills, but who are not experts on Linux. Therefore, we show in detail how to install and configure a Linux operating system on your server, but don’t spend too much time explaining basic Domino features. Instead, we focus on demonstrating that Linux is an excellent platform on which to run Domino 6.